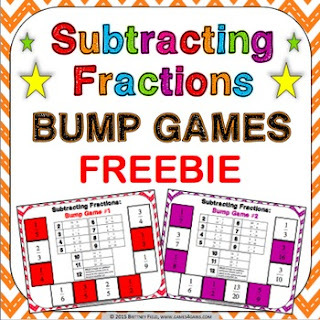 Subtracting Fractions: Subtracting fractions bump games FREE contains 2 different bump games to help students practice subtracting fractions with like and unlike denominators. These bump games are so simple to use, and take a minimal amount of prep. Simply print out the game sheet, get 2 dice and 20 counters, and you'll be ready to go! To play, students will roll the dice and find the corresponding subtraction problem. Then, they have to find the correct answer on the game board and cover it with their counter. Students have to get all of the counters onto the game board without getting "bumped" off by the other player. Looking for more fractions bump games? Check out my full Adding Fractions Bump Games, Subtracting Fractions Bump Games, Multiplying Fractions Bump Games, and Dividing Fractions Bump Games sets that each contain 10 different bump games. Would you like even more FREE bump games? Check out my blog post about bump games at Games4Gains.comand get some 8 FREE multiplication fact bump games. 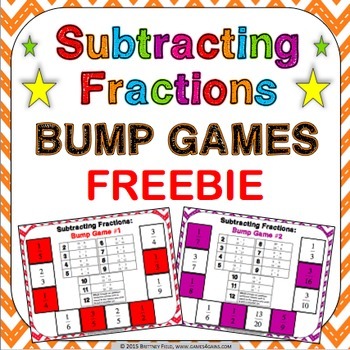 Be sure to visit My Store to check out my other freebies (including my Adding Fractions Bump Games FREEBIE) and games! CLICK HERE to sign up for exclusive sales and freebies. You'll also receive 12 FREE FRACTION BUMP GAMES in your email just for signing up.